To drive the cold winter away, I’ve been compiling a list of my favourite things about living in Edmonton. You know, good, warm, tasty things that help take the sting out of a six-month chill. Today’s offering is that time-honoured Canadian tradition, the backyard firepit party. 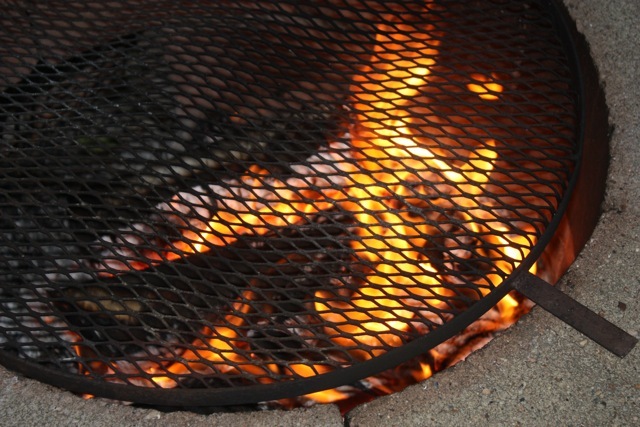 I’m pretty certain Edmontonians didn’t invent the firepit, but we sure know how to get the most out of one. And why not? What’s not to like about sitting around a fire – in summer and yes, even in winter – with friends, sipping a few cold (or hot) ones and solving the problems of the world (or the slumping hockey/baseball/curling team). 1) the backyard and 2) the fire. The backyard means you don’t have to find a campsite or other suitable venue; you just have to make sure you are friends with the sorts of good, like-minded people who have a similar penchant for sitting in a circle around an outdoor fire, mesmerized by the flame and getting high from the scent of burned marshmallows and singed rubber (from putting your sneakers a little too close to the life of the party). And the fire? It is what it is. Food is an integral component of the firepit party, of course. 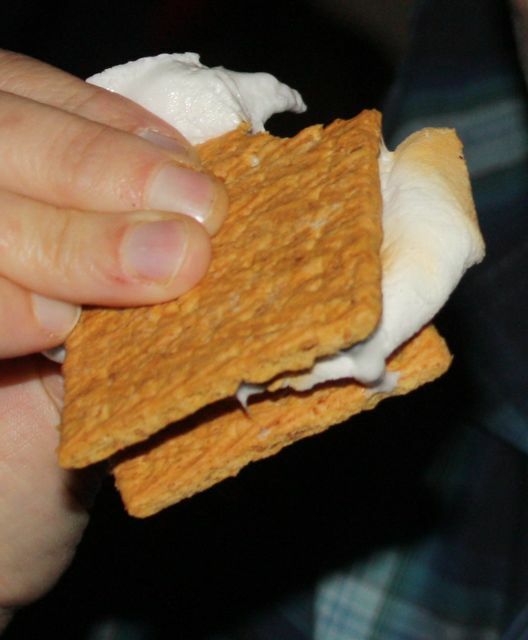 All of the standard summer backyard/patio/barbecue/camping snacks are encouraged, but the ones that make the most sense are things you can toast/roast on the flames or coals, like wieners, marshmallows and s’mores. Last September we introduced s’mores — so named because you always want some more! — to a visitor from New Zealand. The list of ingredients (marshmallows, chocolate to melt, graham crackers, etc) clearly left her cold, so we cooked up a few for her to sample. She tried to look happy about that but was still obviously unimpressed. Horrified, possibly. Questioning our sanity, definitely. But she pretended to like it. She returned to Auckland not quite sure what possesses Canadians to huddle around fires in their neighbours’ backyards, sometimes in weather so cold parkas are required, munching on cookies and corn chips, swilling Sleeman’s and frozen margaritas in plastic martini glasses. It’s one of those things about the Canadian mystique that you have to just accept and not overthink — like three-down football. Five-pin bowling. Street hockey. Block heaters. Beavers. Politeness. And poutine. I lived in Edmonton for almost a decade before I ventured to Gallagher Park on the second weekend in August. 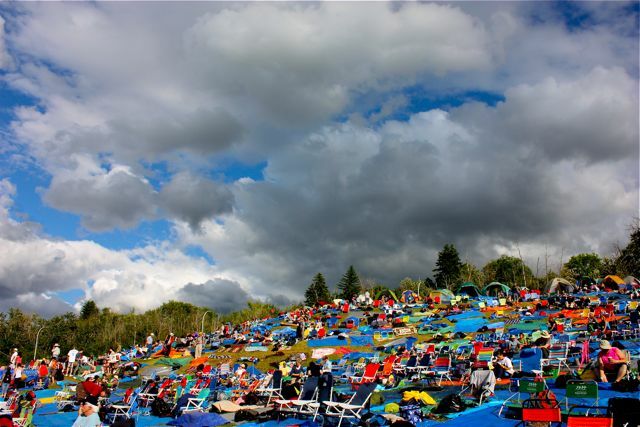 Friends had gushed on about Edmonton’s storied folk music festival, yet for some reason I steered clear of it until the early ’90s. Then I got my first taste … and have been hooked ever since. The Topp Twins. Jennifer Berezan. Ferron. Catie Curtis. Melissa Ferrick. Janis Ian. Ani. The Waifs. The Nields. Serena Ryder. Sarah Harmer. Iris Dement. Long John Baldry. There have been marriage proposals … and actual weddings … and a whole lotta flirtin’ in between. Oh yeah, baby. Each August I heard things that caused me to race to the ‘record tent’ to purchase music by artists I’d never heard of and who now, years later, still feature prominently on my iPod. 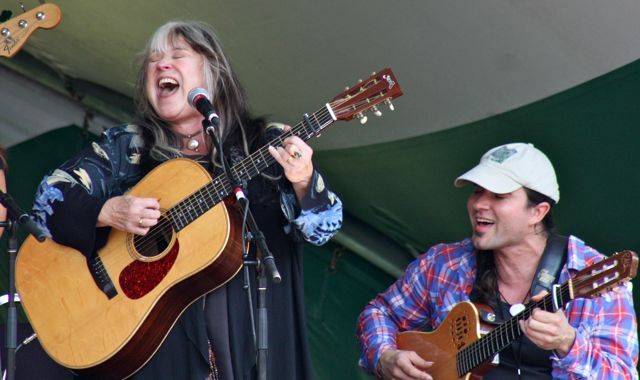 Of course, I’ve missed a few folkfests here and there – we always seem to be out of town when Emmylou Harris drops in. And family commitments prevented me from hearing Joni Mitchell and Elvis Costello in ’94. Chris Isaak shuttin’ her down a couple of years ago? I was, I confess, too tired to stay around for the finale that year. But managed to stick for the return of k.d. lang and the Siss Boom Bang this year; another outstanding lineup from three decades of outstanding lineups. Other 2011 notables (for me) were Imelda May, Lissie, Angelique Kidjo, Lyall Lovett and Jeremy Fisher, to name just a handful. Rather than gush on and on about how wonderful this festival is — I haven’t even mentioned the green onion cakes, chickpea curry, getting all folked up in the beer garden on more than one occasion, eating lunch with Dar Williams (still kicking myself that I didn’t have the guts to introduce myself and my partner as Jane and Amber), or the legendary tarp races of last century — I’ll just sign off with a gallery of snapshots from over the years. Art by Laurie MacFayden Edmonton artist and writer Laurie MacFayden’s webprint, showcasing her paintings + book stuff.